I find that the best way to pick oneself up from really bad news is to get some exceptionally good news. I was lucky enough to get some in the form of an invitation to speak at a conference in Cambridge in September. Cambridge! I’ve never been and am over the moon to be able to go. Seriously. When I found out, I must have been jumping high enough to get to the moon, or at very least Cloud 9. First and foremost, I’m just so overjoyed to have the honour to stand on a soapbox for 20 minutes and get to talk about two of my favorite subjects: Titus Andronicus and food! Mmmm….meatpie! What is also keeping me up at night is the chance to reunite with some very special friends and see some outstanding, once-in-a-lifetime kind of theatre. Pièce de résistance? 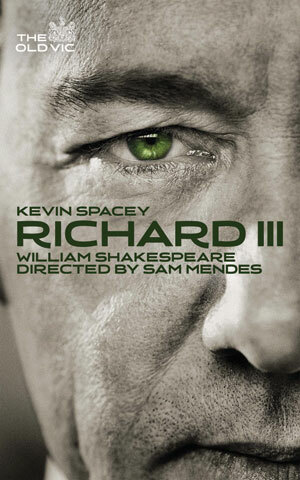 Richard III, directed by Sam Mendes, who is reunited with the man playing “bottled spider” himself: Kevin freakin’ Spacey. Pete calls the number, because this is such a hot ticket that tickets for most showings aren’t even offered online. The fellow on the phone tells him “we only have single seats left, and they’re all restricted view.” At this point in reading his message, I’m biting my nails. Pete asks, “For which days?”, to which the man on the phone responds, “All of them.” Pete calls this a “tragedy of fittingly Shakespearean proportions,” but luckily, there’s more to this message: “You’re not under 25, are you?” Yes! Yes we are!!! What does this mean??? 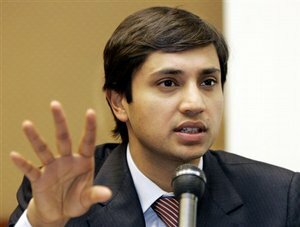 Thanks to a kind donation from steel magnate Aditya Mittal, there are 100 seats available for the under 25s at just £12 each for every performance of the Old Vic's forthcoming productions. It means that the English are fantastic! Despite all the cuts to arts funding since the beginning of the accursed “credit crunch,” the powers that be are still so concerned with the cultural upbringing of their youth that they have special seats reserved for us at theatres. Where exactly? Front row. For how much? Well, they’re normally £42.50, which is a bargain if you ask me: I’ve had worse seats to worse plays in North America and the tickets have cost a whole lot more. But we’re not paying £42.50. We’re paying £12 to sit at spitting distance from Kevin Spacey. I hope that one day, there will be a whole blog post devoted to being spit on by Kevin Spacey. God bless the English and their determination to stand behind their theatre. They have made me a very, very happy girl. Great to see corporate patronage. Spacey’s natural home as a screen actor is malevolent pathology. In other roles he is superb, even Oscar worthy, but his magnetism is at its unparalleled best when he is gallivanting in the dark territory with his amoral smirk.